Welcome back to Writing Prompt Friday. Yes, it’s now the day after Valentine’s Day, but I’ve got a ready theme, so I’m running with it. January 13 is National Rubber Ducky Day! It’s rare that I use exclamation points, so yes, this is exciting!! Now, I could share a bunch of rubber ducky facts such as they were introduced in the 1800s as children’s toys. I could cheer them for their charity work because they’re used in rubber duck races all over the world to raise money for worthy causes. I could applaud them for the impact on research—thank you, Friendly Floatees, for helping oceanographers learn more about how ocean currents move. 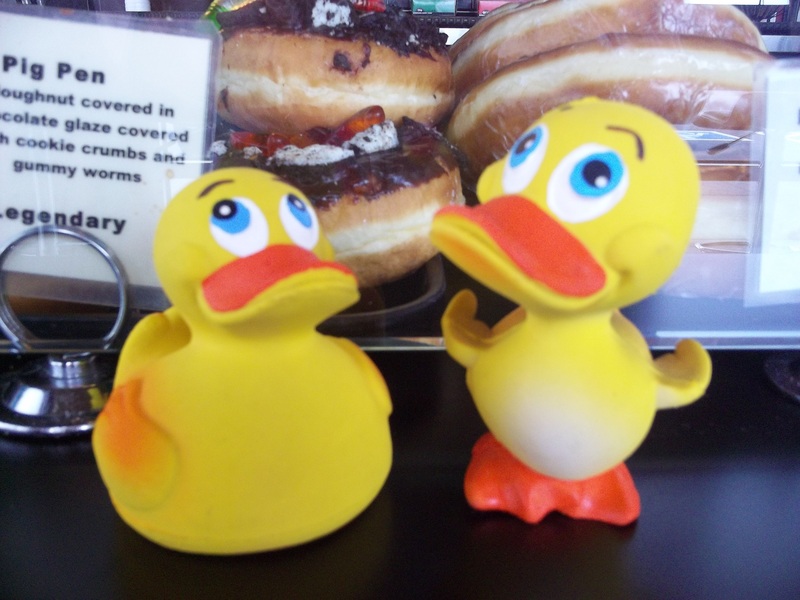 If you’re wondering what they have to do with writing, I could share that there are actually two schools of thought the correct spelling (“rubber ducky” vs. “rubber duckie”); the debate rages on. From the 2007 Rubber Duck art installations created by Dutch artist Florentijn Hofman to the chart-topping, 1970 rendition of Bert and Ernie’s “Rubber Duckie” hit, there’s an endless encyclopedia of rubber ducky facts, figures and trivia I could share. Happy National Rubber Ducky Day 2015! Yes, I missed it last year because I’m terrible. My flock will never let me forget it. If you’re interested, feel free to check them out. However, I’d like to take this year to share why I love them so much. They’re adorable. It’s hard to look at a rubber duck and not smile inside. They’re accessible. 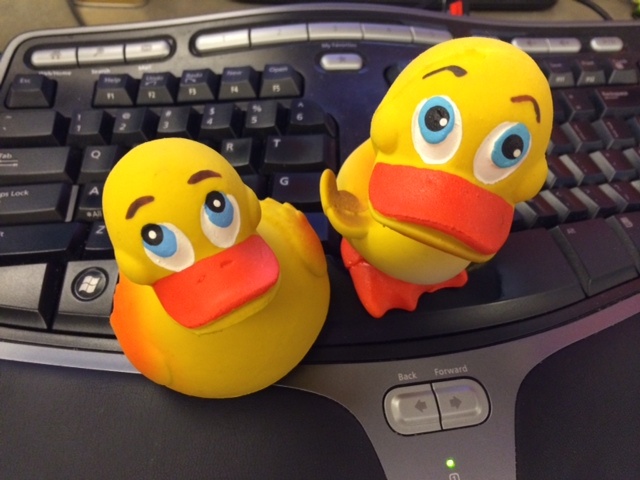 Unlike hot-ticket-toys, rubber ducks are easy to purchase. They’re friendly. I have yet to read about a rubber ducky biting someone. They’re discreet. Chances are your rubber ducky won’t post pictures of you in the bathtub. They’re diverse. Thanks to the latest advances in toy-making tech, you can find a themed ducky for almost any occasion. And they come in different sizes. They’re affordable. Buying a standard rubber ducky usually won’t break the bank. Plus, some come in sets. They bring out the child in you. ‘Nuff said. But there’s a bigger reason I love rubber ducks. I buy only those rubber ducks that represent something special in my life. My first rubber ducky belonged to my beloved puppy, who passed to the Rainbow Bridge several years ago. When I bought it for her, I was hoping that it would make her baths less stressful on her. I was wrong. I have another that commemorates my move to Seattle. The one on the right I bought during my first trip to Europe. A group of small duckies mark my getting married. Several that are gifts from loved ones. My rubber duckies mark vacations, anniversaries, loved ones, major life moments. When I’m surrounded by my flock of special squeaky sweeties, I’m surrounded by memories that make me smile both inside and out. So, happy National Rubber Ducky Day! I hope you have a good one.